Asian flavors and pork have always been a match made in heaven, and this recipe is no exception! When cooking pork, it is always wise to use an internal thermometer to measure the internal temperature. You want it to be safe, but overcooking will make it too dry. In a shallow bowl or baking dish, marinate pork chops in Hasty-Bake Asian Marinade for 1 hour, flipping chops at the 30 minute mark. Remove pork chops from marinade and generously coat both sides with Hasty-Bake Asian Rub. Sear both sides of pork chop. 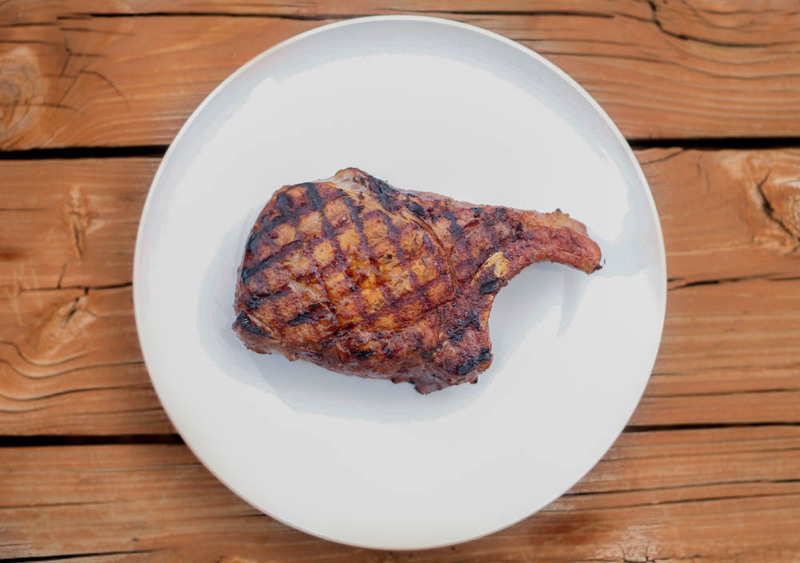 Move coals to baking and put pork chops on the top rack (if you have one) and bake 10-15 minutes or until the center has reached at least 145 degrees for medium rare, 150 degrees for medium, 155-165 for medium well, and 175-185 for well done. Pork can safely be consumed at medium rare, and that is my recommendation. Once the pork is ready to come off the grill, allow it to rest for 5-10 minutes. Garnish with Hasty-Bake Asian Pickled Onions.